Shimla, the one word that can bring images of cool wind, of magnificent mountains, snowfall and nature in her best form, is a capital city of Himachal Pradesh. The other capital is Dharamshala, which is located about 240 km from Shimla. This magnificent hill station is encircled by Mandi, Kullu and Kinnaur, which are also brilliant places to visit. Being one of the most sought-after vacation destinations, Shimla is known as Queen of the Hills for its beauty. It used to be a summer capital during the reign of the British Raj. The city is nestled by the foothills of the Himalayas. 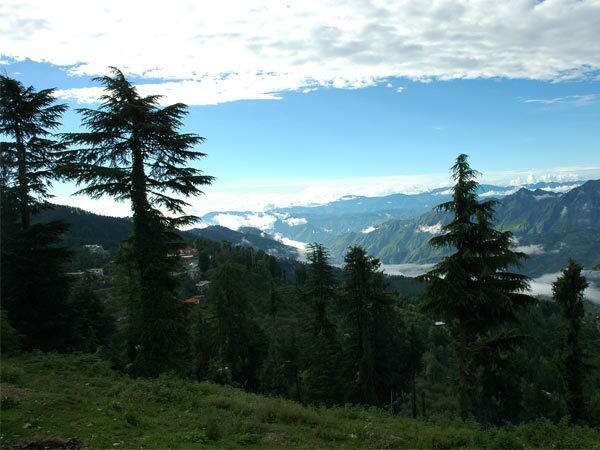 Since Shimla is located just about 340 km from Delhi, the hill station can be an ideal escape, especially during summer. Since Shimla is a very popular destination for a vacation, it is well connected to all parts of India by air, train and road and especially to Delhi. A vacation at Shimla guarantees a holiday filled with fun and frolic in the laps of nature. Although it is a summer destination, visiting Shimla during winter will be utterly exciting since the whole city turns pristine white with snowfall. One can witness Neo-Gothic architectural styled buildings here due to the major presence of the British Raj. Apart from sightseeing, Shimla is perfect for mountain biking due to its steep terrain and skiing during winter. Here are the places you can see at Shimla. The biggest attraction of the Jakhoo Temple in Shimla is the statue of Lord Hanuman. It is the world's largest statue of Lord Hanuman ever made. It is erected at such a height that the statue is visible from almost all parts of the city. The temple is usually crowded the most during Dusshera, that is, during October. The statue is located on the Jakhoo Hill at a stunning altitude of 8000 ft. The Ridge plays a major role in all the activities of Shimla since it is located in the heart of the city. It is a huge, open road that connects two other popular spots of the city, that is, Scandal Point on the west and Lakkar Bazaar on the east, while the Mall Road lies parallel to the Ridge. The road is lined with shops and beautiful pine and deodar trees, which are covered in snow during winter, making the entire place look dream-like. Much opposite to the name that the place suggests, Scandal Point is located at a scenic spot where locals, tourists and couples enjoy spending time; benches are spread across the place. The legend behind the name is that during the British Raj, Bhupinder Singh who was the king of Patiala is said to have eloped with the daughter of the British Viceroy. The point also has a statue of Lala Lajpat Rai, a respected Indian freedom fighter. For all the souvenir or gift shopping, head to the Lakkar Bazaar on the east end of The Ridge. This market has a huge collection of wooden articles and handicrafts that make for perfect, beautiful souvenirs. Another attraction of the Lakkar Bazaar is the roller skating rink. So slip on your roller skates and get ready to skate through Shimla's Lakkar Bazaar! Formerly known as the Viceregal Lodge, the building that has now been turned into a research centre used to be the residence of Lord Dufferin, who was the Viceroy of India from 1884-1888. The building holds great historical importance since many pivotal decisions were made in this very place during the independence of India. It was designed by Henry Irwin in a Jacobethan style of architecture. The toy train of Shimla runs on a narrow-gauge railway, that is the Kalka-Shimla Railway. It was included as a UNESCO World Heritage Site in 2008. The railway track was constructed in 1898 during the reign of the British. Since the track is built against the mountain region, vistas of the mountains, pine trees and the pristine nature, while travelling in the train, are absolutely blissful. Visit Kali Mata Temple and Pinjore Garden when in Kalka. The Himachal State Museum, also known as Shimla State Museum, was built in 1974 and it has been preserving the culture and tradition of the region in the form of handicrafts, sculptures, paintings and more. At first sight, the museum itself gives an insight on the presence of the British due to its colonial style of architecture.